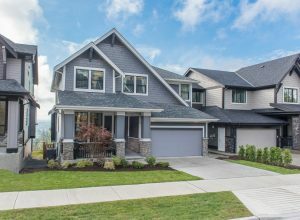 Only a handful of walk-out basement homes remain at Foxridge Homes spectacular The Ridge at Burke Mountain. Located on Wesbild’s The Foothills at Burke Mountain, these homes feature ample living space, attached two car garages, over-height ceilings, expansive windows allowing for plenty of natural light, large entertainment-size kitchens complete with high-end Bosch stainless steel appliances and top-of-the-line ‘Platinum Collection’ finishes throughout. Foxridge is currently has one move-in ready home – The Addington! Located on Lot 92, The Addington features five bedrooms, 4.5 bathrooms and over 5300 square feet room for your family. Their price of $2,388,900 includes GST and finished basement. Drop by their sales centre to learn more!